Many people tend to associate gold and silver bars with the days of the past, but the reality is that they are a highly functional and even profitable way to keep your savings. For one thing, the heaviest gold and silver bars can be worth hundreds of thousands of dollars making them a much more compact and convenient alternative to storing stacks and stacks of cash. For another, over the centuries the price of gold has continually risen, meaning that you can actually multiply your savings by keeping it in precious metal form. Convinced yet? Great, now it’s just a matter of knowing where to find gold and silver bars which is why we’re here to help! 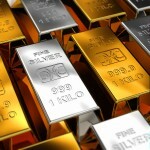 The safest and easiest place to buy gold and silver bars is at your local bank. Most bank branches in Canada will sell bars in all sizes from 1 oz. to 1 kg. The benefit of buying your precious metals from a bank is that they’re guaranteed to be authentic. Please note however, that after selling your wares you’ll be expected to claim a capital gain or capital loss to your bank on your tax return for that year. Of course, buying your gold and silver from an online auction site like Ebay is also a good idea and a great way to get your goods at a reduced rate. It’s important to realize however, that even with the improved security precautions being taken in the 21st century, there’s no way to 100% guarantee the authenticity of your bars before receiving your purchase. Furthermore, buying your gold and silver from an unauthorized retailer can cause a bit of inconvenience when it comes to getting rid of it. For instance, most potential buyers will be hesitant to make an offer on a bar that’s either unregistered or has an unfamiliar hallmark. Indeed many will actually demand that your gold or silver be melted down to check for purity, and re-set into bar form. Most cities will have a fairly long list of confirmed gold and silver dealers in their white pages listing. You should definitely shop around for the best price, but also be sure to buy from somebody reputable in order to avoid some of the problems mentioned above when you try to liquidate. If you can’t find any reviews or information about a certain dealer online, it might be a good idea to stay clear. When it comes down to it, investing in gold and silver bars is an easy, sensible, and quite frankly veryunderrated way to save your hard-earned cash. Best of all, it’s easy to find as long as you know where to look…and now you do!